The story of Jane Deming is the story of a young girl who joins her step-mother and baby brother on Mr. Mercer’s ship traveling from the East Coast to the "promised land" of Washington Territory to start a new life. Along with them are Mr. Mercer’s girls, a large group of single women he was commissioned to bring to the single bachelors of Seattle (true story!). This is a story about expectations and what it means to broaden your mind. It is also the story of finding one’s place and finding family. I especially love the character of Mr. W and the way he interacts with Jane, empowers her and teaches her to survive. The Many Reflections of Jane Deming is a wonderful frontier story that covers an interesting piece of history and features a strong, relatable, lovable female lead. I have already recommended this gem to my kids, now I’m recommending it to yours. The Vanderbeeker’s are a family of two parents, five children and an assorted group of animals who live in a brownstone in New York City. When their landlord refuses to re-sign their lease before Christmas, the kids band together to try and save their home. The Vanderbeeker’s were strongly reminiscent of the Penderwicks to me, which is high praise. I loved the strong sense of community displayed in this book, both within the family and outside of it. The characters were fun and engaging. The plot was entertaining and sweet. All in all, this book contains a wonderful family story that I highly recommend. I am already looking forward to the second book due to release in September of this year. And now, for a book that is pretty much the opposite of The Vanderbeeker’s. The Willoughby’s is an irreverent, tongue-in-cheek, absolutely-not-to-be-taken-seriously story of an “old-fashioned” family that acts anything but. The parents, who don’t really like their kids, make the decision to try to ditch them about the same time that the kids, who really don’t like their parents, make the decision that they’d really rather be orphans. There were a few things that made me a little uncomfortable as I read. I may be way over-sensitive, but when I’m reading for others… well, I’ll fill you in and you can decide if it’s okay for your kids. At one point, an old bachelor that enters the story thinks the following about the kids’ nanny, “if he was not such a decent man, he might be tempted to pat her large behind affectionately as she bent over.” Thankfully he doesn’t! And, throughout the entire book the kids are hoping their parents die on their world adventure (which they eventually do)... so there's that too. But, this book is not meant to be taken seriously. It is ridiculous and that is what makes it fun. I'm hoping one of my twins will pick it up as I think he'd really appreciate the humor. This little book does include a large vocabulary and classic kid lit is poked fun at, but the author includes a mini-dictionary in the back and a bibliography of the classics she mentioned in the story to help her readers out. Who knows, they may even be inspired to pick one of those classics up for their next read. 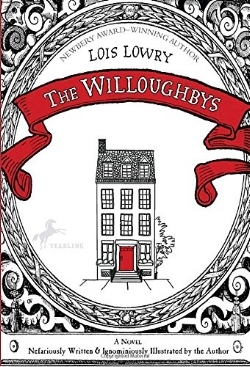 All in all, the Willoughby's was a ridiculous fun read, relatively short and it ends happily in spite of the plot.